Significant events have pushed this year by quicker than others: Linda’s heart condition, Benjamin and Christina’s wedding, Brooks and Elizabeth’s new house, a grand new grandson along with Paul’s travels. But it is a blessing that rushing time makes us more easily remember the glories of Christ’s first coming and eagerly anticipate His second. Click here or on the Bucknell newsletter to read and see the many pictures of our growing family. For more up-to-date news join us on Facebook: Paul or Linda. 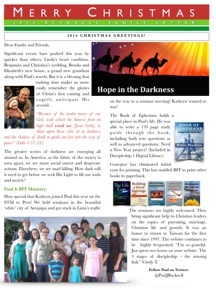 Sign up for our family newsletter! Do you know BFF has a store with lots of eBooks and much more! Join BFF on Facebook! We appreciate your helpful comments! Join our Bucknell family email signup!